The Konnichi-WOW raffle draw was held last April 11, 2017, under the supervision of Department of Trade and Industry (DTI) Representative Rhoda Sevillino and Travelbook.ph Business Planning and Market Strategy Officer Mary Angeli Pasquin. 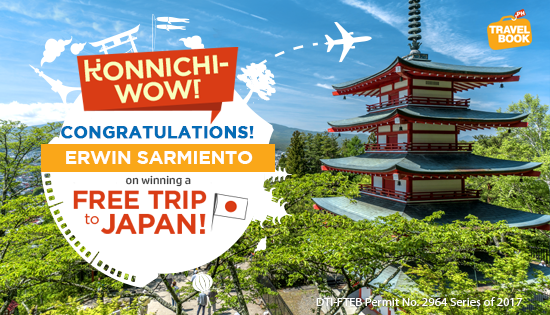 Sarmiento is the first of the three winners of TravelBook.ph’s Konnichi-WOW promo. The said promo was launched last March 10 in celebration of the company’s fourth anniversary and continues until May 31, 2017. Two more winners will be announced in May and June 2017 respectively. Interested travelers can still join the next raffle draw simply by booking their next hotel accommodation through the TravelBook.ph website or the TravelBook.ph mobile app available for Android and iOS.